Each year, Bay Ridge Prep hosts a special gathering to celebrate the hard work and achievements of its faculty and staff. 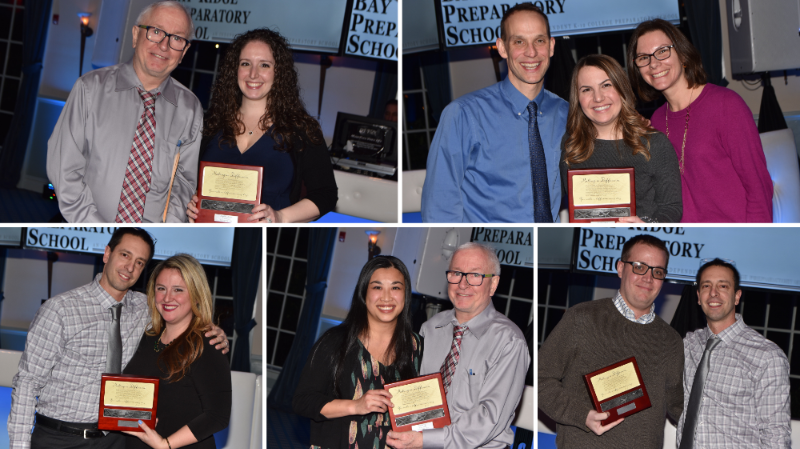 During this annual tradition, employees who have reached their tenth year with the school are honored for their decade of service to Bay Ridge Prep. Honorees for 2019 were five educators: Linda Catani, a Lower School faculty member, and Upper School faculty members Angela Loffredo, Helen Ng, Tim Raphael and Rebecca Rice Chiusano. Before an audience of their colleagues and family, each was presented with a "Making A Difference" plaque and a brief speech about their contributions to the school community over the past ten years. Linda Catani was described by Lower School Director Kate George as "a magician" who has the ability to magically work with a variety of students and help them easily understand what they are learning. Angela Loffredo "imbues her students with a love of literature and takes on academic challenges and raises the bar with high expectations," Dr. Michael Dealy, Co-Head of School, said in his presentation. Helena Ng "shares her creativity with others so effortlessly and has really brought out the 'artist' in our students," Dr. Dealy said. Tim Raphael's "enthusiasm and can-do mentality has transferred over to the many students that he has worked with over the past ten years, in ever-growing numbers," said Guidance Director Dr. Chris Nuesell. Rebecca Rice-Chiusano "is a true supporter – of her students, her colleagues, her family, and her friends. As a teacher, she brings out the very best in her students," Dr. Nuesell said.